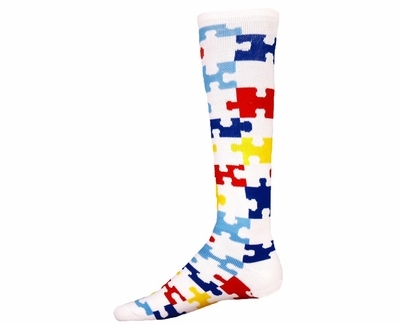 PUZZLE SOCKS ... Show your support for Autism Awareness with these Over the Calf Puzzle Pieces Socks. A percentage of the proceeds from the purchase of these Puzzle Socks will be donated to Autism Research. Puzzle Socks feature lots of Sewn-in Colorful Puzzle Pieces going all the way around the sock, and have a Sewn-in Heel construction with a cushioned sole and foot which provide lots of comfort and durability. Puzzle Pieces Sock Material: 77% Acrylic, 14% Nylon, 6% Polyester & 3% Spandex... these socks are long and stretchy. * * You can Mix & Match Sizes to get Quantity Prices! Care Instructions: Due to the sewing weave method of these Autism Puzzle socks - Hand Washing or Wash Separately on Delicate Cycle, and Tumble Dry Low is highly recommended. These fun & colorful Puzzle Piece Socks can be worn while playing many Sports: Volleyball, Soccer, Basketball, Softball, Cheer, Dance, Lacrosse, Baseball, Football, Running, etc... so make sure to buy enough for the whole team. NOTE: We've done our best to show the true color of these Autism Puzzle Socks, however since all monitor resolutions and brightness settings are different, these bright colors may look different on your computer screen. PLEASE call us if you have any questions about color-matching to uniforms, etc. Thank You. Bought these for our travel softball team for their Autism Awareness tournament. They are great! They were exactly what I ordered. They are great socks for softball. I purchased these socks for my son's soccer team to wear for Autism Awareness month. The kids and parents all love them. Good quality sock, not thin like some baseball socks. Socks held up well even after washing. Sale price was amazing! Quality was great. I was surprised at how long they were, but that is just being picky on my part. Thanks! Great! Fast shipping, cozy comfy socks with a good quality! Love the cause and the quality! Quick shipping too. Exactly how I wanted them to be.